This thread exists to provide a list of Frequently Asked Questions (FAQ) relating specifically to Daz Studio Pro, and our answers to them. 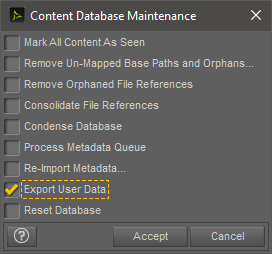 Right-click on the label for the Smart Content or Content Library pane and choose "Content DB Maintenence..."
In the dialog that is displayed, select the "Export User Data" option. Click "Accept"—this generates one or more files named "UserData_#.dsx" in your primary content directory*. In the dialog that is displayed, navigate to the “Content Library” page and click on the “Content Directory Manager” button. Your primary content directory is the first one listed in the "DAZ Studio Formats" section. General Release and Public Build are release channels, while BETA is a phase of development. General Release - This channel is where the production ready build is distributed, and is open to the general public. Publishing Build - This channel is where [optional] builds that are not considered ready for General Release, but are considered stable enough to introduce into a production environment by early adopters, are provided to our Published Artists—determined by the Publishing department. This channel typically provides a build that is in the BETA or Release Candidate (RC) phase of development. Public Build - This channel is where the builds that are not considered stable yet are provided for testing by the general public. This channel typically provides a build that is in the BETA phase of development, but technically can provide a build in the ALPHA phase. Private Build - This channel is similar to the Public Build channel, except it is limited to a select group of individuals that serve as the "front line" or the "canary in a coal mine" for a time before the build is promoted to a less restricted channel. This channel is more likely to see an ALPHA build than the Public Build channel is. Dev Build - This channel provides "bleeding edge" ALPHA builds; sometimes referred to as the "nightly build"; although the builds are not limited to one per night or to strictly occurring at night. Yes, it has. Considerably, actually. The Valentina based service supported by earlier versions of Daz Studio was deprecated with the General Release of 4.8. At that point it stopped being included with the application and could only be obtained through Customer Support on a case by case basis—e.g. firewall/anti-virus software conflicts. Starting with the 4.9 builds, the Valentina based service is no longer supported in Daz Studio. The PostgreSQL based service has proven itself to be much more stable and much less prone to the data corruption issues that many have experienced with the Valentina based solution in the past. The PostgreSQL based solution has also proven to be somewhat faster. With the PostgreSQL solution, there is no longer a need to start a service that runs in the background. Normally, the PostgreSQL server starts when the application starts and stops when the application stops, unless another application, like Install Manager, is connected to it—in which case it will stop when the last application connected to it closes. Explicit control to start the service is provided via an action (in the Content Library pane option menu) and a button (in the Smart Content pane) without ever needing to leave the application. Explicit control to stop the service is also provided via an action (in the Content Library pane option menu). To help get you up and running with the new PostgreSQL service, we've added a separate package in Install Manager that will automatically migrate any existing data from your Valentina database—you simply install it after the PostgreSQL server is installed. We've also included an "Import Metadata from Valentina" script with the Built-In content. The amount of time required to migrate the data will vary depending on the amount of data you have and your system specs. *Note: While the PostgreSQL server is installed, Install Manager will not install any data to the Valentina database. It's about improving the Daz Studio user experience. Support tickets and bug reports provide important clues as to the needs of you the user, but they are only hints. This improvement program allows us to to "see" how the features of Daz Studio are actually performing and where users are getting hung up. If you choose to participate in the program, the statistics we collect are anonymous and contain no personally identifiable information. We respect your right to privacy. That said, if you choose not to participate, we respect that too. We encourage you to participate. In doing so, your use of the application will have a greater influence on where we focus our efforts. "Genesis 3 Starter Essentials", "Genesis 2 Starter Essentials", "Genesis Starter Essentials", and the "Default Lights and Shaders" packages have not been updated beyond what is already currently available. *Note: Install Manager users, and now users of Daz Studio 4.9 when the products are installed through the application, are notified of product updates when they occur. If you have previously added the DAZ Studio 4.x Pro product to your account, launch Install Manager, log into your account and type "DAZ Studio 4.9" into the filter field to filter out anything else. Then simply download and install as you would normally. Optionally, you can locate, download and install DAZ Studio Pro from the Product Library [once you are logged into your account] by entering "DAZ Studio 4.9 Pro" into the text field near the top left of the page and clicking the "Filter" button, or by clicking here. Then, simply click the green "download & install" button to launch Install Manager with an appropriate filter or click the blue "download" button to download the standalone installer. If this is your first time downloading DAZ Studio Pro, simply follow this link, click the "Add to Cart" button on the page and then follow the checkout process. *Note: This General Release version is available through Install Manager as well as a standalone installer. Yes! You can have the General Release and a Public Build (as well as a Private Build and/or a Publishing Build for individuals involved in those endeavors), of the same major version, installed at the same time. Be aware that the settings for each of the builds are stored independent of each other. This includes mapped content directories, layout, style and style colors, among many others. The Daz Studio 4.5 SDK has not changed in any way that causes it to be binary incompatible, which means that any plugins created for a previous version of Daz Studio (4.5.0.114+) should continue to load and function with this build. That said, as with any new release, there is always the possibility that a plugin has had bugs fixed or features added, so the latest versions should be downloaded and installed if they are provided. Plugins that are currently built/produced by Daz 3D will provide a separate package specifically intended for the Public Build. 3rd party plugins that Daz 3D creates install packages for will be updated to allow simultaneous installation into the General Release and the Public/Private builds. These packages will display as "Product Updates" within Install Manager once they have been updated. Well, that depends on how the metadata was exported and, more importantly, what is in the metadata when it is imported (or installed, or migrated). "User Data" files can be used to define every element of metadata for a given asset, except for an asset's association to a product—products are typically produced by vendors, therefore a product is defined by "Vendor Data" not User Data. This is not to say that end users are somehow prevented from creating products of their own and assigning metadata of their own. Rather, when a user begins to create products and assign metadata of their own, they are assuming the responsibilities of a vendor and as such must become familiar with the underlying mechanisms involved. One very important thing to understand is that User Data can (and will) be superseded by the installation (or update, or import, or migration) of Vendor Data, except for in very specific situations. To be clear, in the event of a collision between data elements defined by a user and data elements defined by a vendor, the data elements defined by a vendor will typically replace those defined by the user. It is also very important to understand that when Vendor Data for a product is installed (or imported, or migrated), all previously defined Vendor Data associated with a given product is dropped entirely and the newly supplied Vendor Data is inserted in its place. This behavior is what allows a vendor (e.g., Daz 3D) to update incorrect or out-of-date metadata for a product regardless of the version that may currently be installed. Another important thing to understand is that while 4.8 and earlier structured asset metadata such that all instances of an asset, across all installed products, shared a common metadata definition (i.e., changing something in one changed it in all), 4.9 takes a different approach and maintains the metadata for given asset uniquely within the product that provides it—this allows a specific asset, in a specific product, to be found (something that was very difficult to accomplish in prior versions). In 4.9, all assets belong to a product (at least one). If a relationship with an official product isn't explicitly established, an implied relationship with a "LOCAL USER" catch-all product is established. Now, certain data elements that allow for multiple definitions (e.g., categories, compatibility) do support the co-existence of information defined by the user and information defined by the vendor, but only where they do not define the same information*. In the case where User Data and Vendor Data define the same information, ownership of that information is typically awarded to the vendor. Other data elements that can only have a single value (e.g., content type) follow this behavior and are always superseded by Vendor Data (if it is defined). *Note: This restriction is relaxed for categories in 4.9.3.x, in order to support the introduction of "Hidden Vendor Categorizations" and our continued efforts to preserve User Data. Migration from the 4.8 (or earlier, assuming the PostgreSQL CMS is used) tables in the database, to the 4.9 tables, begins shortly after the initial launch of 4.9—before the opportunity to login to Daz Connect is presented. This migration is expected to preserve any custom products and/or categories that are already defined*. When metadata for the products associated with the "current" account has been installed through Daz Connect (automatic upon logging in), the migrated Vendor Data for those products is replaced (as described above). *Note: A bug in the 4.9.0.63 migration causes products that do not define a ProductToken to fail. A separate but related bug causes products that do not define a valid StoreId to be assigned to the "DAZ 3D" store instead of the "LOCAL USER" store; increasing the likelihood of an overlap. Both of these bugs have been fixed in more recent builds. Installing a product through Install Manager once metadata has been retrieved through Daz Connect can be a little tricky. The current version of Install Manager (1.1.0.64) still installs Vendor Data to the 4.8 tables and the initial launch of 4.9 installs various triggers that serve to migrate newly inserted data to the 4.9 tables, provided certain conditions are met. If a product being installed through Install Manager is one where the metadata has already been retrieved through Daz Connect, the metadata that would typically be installed through Install Manager will not be migrated to the 4.9 tables, as the metadata for that product is already being managed by Daz Connect. 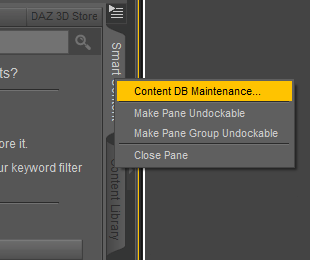 If the product being installed through Install Manager is one where the metadata has not already been retrieved through Daz Connect, the metadata that would typically be installed through Install Manager will be migrated to the 4.9 tables upon import (or install), as the metadata is still being managed by Install Manager—until you next login to Daz Connect*. *Note: Because of the differences in how the 4.8 tables and the 4.9 tables are structured, and because of the way the triggers that allow the migration to occur are setup, installing an update to a product that is not managed by Daz Connect (be that through Install Manager, or through importing in an earlier version) can result in the User Data for the files provided by that product becoming lost. For this reason, until this issue is resolved (scheduled for 4.9.2.x at the time of this post), it is recommended that User Data be exported prior to installing updates and re-imported after the update has been installed. This is the kind of export that the average user should be using when they do not want/need the metadata separated by product. Any dsx files produced by this method are considered User Data when (re-)imported. The GlobalID data element for the Product is defined as "00000000-0000-0000-0000-000000000000"
This is the kind of export that the average user should be using when they do want/need the metadata separated by product. By default*, any dsx files produced by this method are considered User Data when (re-)imported. *Note: Holding the [Ctrl/Cmd] key when clicking the action provides additional options. These options can be configured such that any dsx files produced is considered Vendor Data when (re-)imported. This can essentially be used as a shortcut for the Content DB Editor method described below. Only Daz 3D should be exporting "DAZ 3D" products using this method*. Any dsx files produced by this method are considered Vendor Data when (re-)imported. Vendor Data files typically do not contain Userwords and UserNotes elements (and sub-elements) as these are specifically reserved for end-users. *Note: This does not mean that a product whose StoreID is not set as "DAZ 3D" cannot be created. It also does not mean that said product cannot provide metadata for assets delivered by another product (though doing so increases the potential for confusion). Rather, it means precisely that only the officiator of a given StoreID should export products wherein the StoreID is set to the identifier for that store—simply because of the behavior described above with regard to the manner in which Vendor Data is handled. Do note that it is possible to add StoreIDs (see the Add Store Id sample), and to remove a StoreID (see the Remove Store Id sample) with the exception of the defaults—the 4.9 database provides exactly two StoreIDs: "LOCAL USER" and "DAZ 3D". Manually editing a dsx file to change the StoreID to a value that is not already defined in the database and then importing that dsx file will not cause that StoreID to be inserted into the database. Adding a StoreID must be performed via the scripting API. While it is not without some potentially undesireable side-effects, it is possible to salvage custom User Data that has been exported as Vendor Data. This is accomplished by replacing the value of the GlobalID data element of any Vendor Data dsx file with the "00000000-0000-0000-0000-000000000000" value and re-importing it. This alone will cause certain vendor specific data elements in the file to be ignored (e.g., StoreID, ProductToken, etc.) and the remaining data elements to be interpreted as User Data. One potential side-effect of salvaging data in this way is that you may end up inserting information (e.g., categories, compatibilities, etc.) that would normally be vendor owned (which has since been updated to current standards through Daz Connect) as user owned because the old information is still contained in the file being imported.